The identification of small amounts of steroids in bodily fluids is an analytical challenge. GC/MS is one of the key analytical techniques applied in these areas. For the fast and reliable identification of steroids, mass spectral reference data is essential. 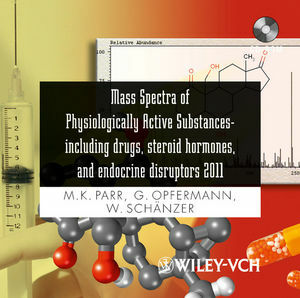 This collection is an invaluable resource for doping control, endocrinology, and clinical toxicology and has been expanded in collaboration with the Institute of Biochemistry and German Sport University Cologne, and now contains 4,182 mass spectra and chemical structures of androgens and estrogens, as well as their trimethylsilyl-, O-methoxyoxime-, and acetal derivatives and beta-2-agonists. Most spectra have been obtained on the same mass spectrometer under identical conditions. The data records include chemical name, chemical structure, molecular formula, and synonyms. Maria Kristina Parr is the author of Mass Spectra of Physiologically Active Substances: Including Drugs, Steroid Hormones, and Endocrine Disruptors 2011, published by Wiley.